Well fellas, 2017 has snuck up on me and I am late as always. Just weighed in Wednesday at 315 fully clothed down from 13 pounds at last check in and was naked then and this time fully clothed. They may have found what is wrong with my lungs too. My new pulmonologist said severe asthma and a bunch of allergies. I am allergic to three local grasses, thistles, walnut trees, and dog dander. Started some new meds and a new inhaler. I had a goal of sub 300 lbs by June at the beginning of the year so I am shooting a little higher and dropping that goal to 280. If I can do that I will have crossed the 100 pounds lost goal since my lap band surgery in 2015. Down to around 180 pounds now. Crazy that I'm very close to the end of the grind from weighing 328 in June 2015. Hello guys just checking in and seeing if anyone else has had some progress. I just saw the doctor two weeks ago and weighed 306 clothed. I have changed my goal now to be sub 300 pounds by April 10th when I see my lap band doctor. I just want to see them surprised as I was 344 at my last visit 3 months ago. The asthma meds are not working though so I am still not doing well in the health area. Hopefully I will be trying to make a little cash in my garage building a few engines a month for a hobby and it will keep me busy and I can drop some more pounds. Being broke from going through the divorce still helps too as I am not having the money to go out to eat. My weight has always fluctuated wildly, and around the end of 2016 I was in the 290 range again. I have cut alcohol consumption completely since the New Year along with other changes, and I weighed in at 275 this morning. Now, I have been experimenting with Shakeology. I feel pretty confident that I can lose a lot more if I can settle in on a good routine. Weekends are the battle right now, because I have been eating leaner during the work week. Well, I suffered through a bout of edema and ended up weighing 309 at the doctors so it will be my goal to be around 280 when I go back in 3 months. On a good note today I am back at 301. The whole knee injury had killed my exercise options right now. I saw the orthopedic doctor last Monday and she said the progress has been much slower than expected and I see her in three weeks to discuss surgical options and get an MRI. Hopefully I will not be recovering all summer from knee surgery. On a positive note, many of you guys know my 20+ year battle with the VA and my disability rating there. The battle was finally won and I was awarded permanent and total 100% disabled. I may never be able to work again, but the benefits I will be getting will be good. I just want to say congratulations to all of you doing this to better your health! My parents are diabetics, my grandparents are diabetics, and I WILL NOT BE ONE. I am down from 185 hovering at 155. Watching my carbs as closely as possible while working out a few days a week. It is a real challenge but it's an important one. Yeah a lot of my family are diabetics and I was on an easy path to one but I feel like I've cut the odds a lot. My weight loss has slowed slightly, around 175 right now...its hard because people now want me to stop losing weight and saying I don't look healthy face wise and stuff. I know I probably have like 8-10 pounds of excess skin that I'm not going to have surgery on, almost my reminder. I've been scared to go near a scale for a while. Kind of frustrating, I was about 30 pounds from my (revised) goal weight. For a long time I was thinking 220 was a good place for me to be, but then my weight got lower and lower, I revised that to 200. I got down to 232, amazing, and even though typically that last bit of weight is difficult to take off, I thought I had an ace up my sleeve as I was slated to start chemotherapy for leukemia (not to worry, I have the "jackpot" leukemia -CLL, very slow moving, not really a lot of symptoms.) They had given me the chemo information packet, which contains all the info about appetite loss, vomiting, nausea, etc., I thought for sure I could turn this negative aspect of chemotherapy into a positive, by piggybacking my chemo towards my goal weight. I'm down to 188 from a high of 196. Goal is 170. Can't seem to shake getting under 188. I've started doing Kickboxing (usually 2-3 times a week) in addition to working out 3 times a week, so I can burn around 800 calories in an hour. I've cut out a lot of sugar, but need to do better. Every Sunday my wife and I make these quinoa bowls - quinoa, veggies and baked chicken. While I haven't lost weight because of it, I notice that I don't get that tired feeling around 2pm like I would having gone downstairs at the office and getting a chicken wrap and fries. And they are delicious too! Still eating too many calories, so I'm eating smaller portion sizes at dinner now. It's tough cause I'm used to eating big dinners, but I want to lose weight more than I want to eat. Keep up the good work everyone. Even if you are in a bad place, keep trying. My best friend's cancer went into remission a couple of months ago. I'm glad chemo is over for you. It'll be an awesome day when science improves and we no longer need to poison ourselves to get 'rid' of cancer. Well guys is was down to 292.4 pounds a few weeks back. I was doing well and ended up going through a few weeks stretch where I ate poorly and ended up back at 307. On the way back down at 302 right now. This knee injury is killing any chances of exercise right now. Been through physical therapy like they wanted with no improvement so maybe I can convince the higher ups with Indiana HIP insurance that maybe they should allow an MRI. What's up guys? Well I am down to 284.6 pounds. Unfortunately I was admitted to the the hospital Friday night and with any luck will be going home tomorrow. I had another incident where I collapsed, presumably from a huge drop in blood pressure. When I collapsed again my legs took the brunt of the injury. It happened Thursday but I was stubborn and did not go get checked until Friday after picking my kids up from school and walking around all day. I ended up in the Anderson Community Hospital ER yesterday because my daughter insisted on me going. Good call from her as I could have had it much worse. My blood pressure was 75/43 upon admission and they are pumping me full of potassium and I had other issues in my bloodwork. I have now had 7 bags IV'd through me. I now have a broken left leg to go along with my bad right knee from the last time I collapsed which I aggravated on the fall too. Thankfully my daughter was so insistent to make me go to the ER as she very well may have saved my life. I drifted for a long time but now have been back on Bulletproof for almost 90 days straight. Interesting little technique that a co-worker recommended. I printed out a bunch of single digits (1,2,3, etc.) and I keep track of how many straight days I've been on the program (similar to the workplace signs 'x amount of days without an accident.' I have it taped to my door and every day when i wake up I update it. I never would have thought this would make a big difference but it has. The main thing is, even if I slip a little bit during the day, the next day I wake up and update my tracker. I think what this really does is keep me from going totally off the rails when i slip a bit. Anyway, since I started doing this it's been 85 days straight. I'm not sure how far I had gotten back up when I started, but I had a appointment with my GP on April 11 and at that time I checked in at 278 fully clothed. Just got back from a bike ride though the IU campus (Memorial Day must be the slowest day of summer in Bloomington, don't think summer sessions have started yet, streets were dead) and I weighed 236.6 (in my undies.) 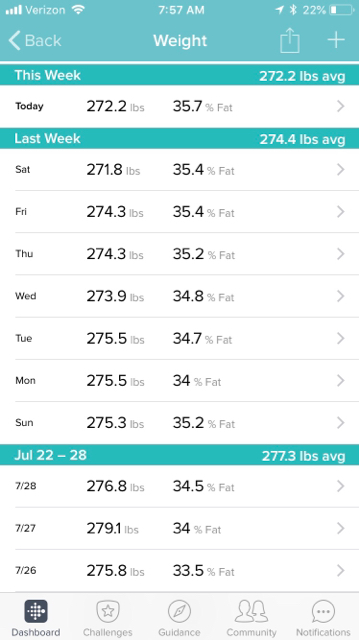 Now I'm no math wiz, but that's like 42 pounds in 48 days, holy cow!! Going back to that goal weight of 220, I'm sitting at 236, looking at my flab and thinking there's still another 'easy' 20 pounds I can lose, and assuming after that there's another 20 pound of 'difficult' fat, I'm looking at a permanent weight of 196 maybe? Inconceivable!! Or would have been a few years ago. I have been alcohol free for almost a year (except for the occasional kombucha). Unfortunately I haven’t fixed my diet as much I had hoped to during that time. So I have made the decision to become vegetarian, and it’s been good for the last week or so. Last edited by Natston; 07-29-2018, 06:53 PM. I am down another 3lbs this week. I honestly didn’t think that it would go this quickly. In addition to the meatless diet, I have also been drinking a gallon of unsweetened tea every day (I can’t drink that much plain water for some reason). I haven’t completely eliminated 2% milk but I can use almond milk almost exclusively for my daily cereal.